Although the idea of mixing nuts (traditionally almonds) with caramelized sugar is French in origin, these pralines are Louisiana ingenuity pure and simple. The earliest recipes called for locally grown pecans and raw sugar brought into the port of New Orleans from Cuban cane fields. 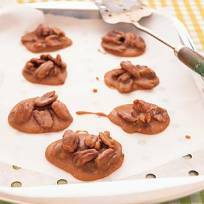 Avoid making pralines on a humid day. They will not set up properly. In a large, heavy saucepan over low heat, combine the sugar, pecan halves, buttermilk, butter and salt. Cook, stirring occasionally, until the sugar dissolves completely, about 10 minutes. Do not allow the mixture to boil before the sugar dissolves or it may crystallize and become grainy. Increase the heat to medium-high and bring to a boil, stirring occasionally but being careful not to scrape any hardened candy mixture from the sides of the saucepan. Cook to the soft-ball stage, 236°F to 239°F(113°C to 115°C) on a candy thermometer, about 15 minutes. Remove the pan from the heat. Stir in the vanilla and almond extracts and the baking soda. As soon as you add the baking soda, the mixture will become lighter in color and foamy in texture. Beat rapidly with a wooden spoon until the mixture begins to cool, thicken and lose some of its shine, 5 to 7 minutes. Working quickly, drop the candy by heaping tablespoonfuls, using one spoon to scoop and another to push the mixture onto the prepared baking sheets. Let stand at room temperature until firm, about 1 hour. Eat immediately, or store between layers of waxed paper in an airtight container for up to 10 days.